Here I share some tips that helped me to follow the ketogenic diet and mainly, stay in ketosis all the time. At the beginning it wasn't easy, I had the keto flu, but I did not give up. I was nauseated all the time from eating so much fat. I was addicted to sugar and my body was not fat adapted yet. Keeping with the system lead me to be in ketosis and become fat adapted. After you went through the list of forbidden and permitted foods, go into your pantry. Remove all the foods that are not keto friendly. If you don't live alone separate one cabinet just for your foods. This will help you stay focused because you don't see the forbidden foods. Think about one meal at the time. Don't think big. Just one meal at the time. When you go shopping plan the menu to ensure that only keto foods are in your plate. Make sure that there is always fat in your plate. If you cannot afford the grass-fed beef or the organic chicken or the more expensive products, it's OK. You can still do it. Start small. One meal at the time. One cup of coffee at the time. You can watch this video of Dr. Westman where he explains the ketogenic diet and brain performance. If you are doing the ketogenic diet to lose weight - Read this page. Keto flu? How to handle it. When you decide to change drastically your system from burning sugar (carbs) for energy into burning fat for energy the body goes through some changes which may affect how you feel. The keto flue symptoms include nausea, muscle cramp, headaches, drowsiness, irritability, aches, sugar cravings, difficulty sleeping and more. Why this happens? The body is addicted to sugar and these symptoms are a side effect of the withdrawal. But it will pass. I managed it by drinking a lot of chicken broth. By drinking broth you replenish the electrolytes that you loose when you cut out natural sources of electrolytes such as fruits and vegetables. You can also take keto friendly electrolytes supplements, just make sure that they do not contain sugar. You can also make your own drink by taking 1 cup of water and 1 tsp. of mineral sea salt and lemon juice. Muscle cramp occurs when your body is in ketosis it excretes the salt from your system and the electrolytes go out of balance. This is how you know that you need more salt in your diet. Just drink more fluids and get enough salt. chicken broth can help. I also take a magnesium supplement. Here’s a suggested dosage from the book The Art and Science of Low Carbohydrate Living by Drs. Jeff Volek and Stephen Phinney: Take 3 slow-release magnesium tablets like Slow-Mag or Mag 64 a day for 20 days, then continue taking 1 tablet a day afterwards. This is another side effect of the ketogenic diet. At first, since your body doesn't have that much waste like it used to have the eliminations occur less frequently. Eat at least 8 cups of vegetables a day. Drink plenty of fluids. Drink the Kale shake. This is how you can bring fiber back to your diet instead of the fiber in the grains that you used to consume. Once you start following the ketogenic diet, don't stop your medications. Continue monitoring yourself and schedule a doctor's appointment. Consult with your doctor and let him/her know that you are following the ketogenic diet. Keep an eye on your medications intake, but by all means, don't stop them on your own. For me, one of the wonderful miracles was that when following the ketogenic diet my blood pressure went down. I monitor it twice a week and I keep a record of it so when I go to the doctor next time I have a history of readings to share with him. My blood pressure medication was cut in half. I am afraid to stop taking it completely because my trauma with my stroke. Hungry for snacks in between meals? Every morning I prepare for myself 5-6 hard boiled eggs. At first, when I was hungry I used to eat an egg. I ate about 5-6 eggs a day. Also if you feel that you need a snack - eat olives and pickles (without sugar) - the last contain salt. They are keto friendly. Drinking hot broth and an egg gave me the feeling that I am actually eating a meal and my hunger went down. When you feel like having a snack, think - is it because I am used to eat something now, let's see if there is something interesting in the refrigerator... Slowly ketosis will help you lose your appetite and looking for snacks will be something from the past. Ketosis lowers your hunger. However, you are used to eat three meals a day and suddenly eating fat is allowed? You celebrate! But hey, don't overdo it. Eat only when hungry. Again, eat only when hungry and stop when you are full. On the ketogenic diet there is no need to count calories. Don't use the old methods from diets that did not work. Just make sure that your plate has a moderate piece of protein (meat, chicken, fish) low carb vegetables and 70% fat. Fat bombs are not necessary - if you are trying to lose weight let your body use your own fat. You don't need to add extra fat - Just don't eat fat free or low fat products. How do I know how much is 70%-80% of my calories in fat is in my plate? Fat is high in calories. When I make my huge salad I put in it spinach, lettuce and little pieces of other vegetables such as mushrooms, red peppers, 1/8 of an onion, sprouts, a few shreds of a carrot (I divide one carrot into 5 salads for the weeks). These vegetables do not contain many calories. To that salad I add the fats: 1/2 avocado, 2 eggs and olive oil. The last three ingredients are high in fat and calories. I don't measure the percentages exactly, but I know that the fatty ingredients have a higher caloric content than the greens. Some people on the internet recommend having a cheat day or a cheat meal while in doing the ketogenic diet. In my opinion this is not a good idea because once you are in ketosis your brain uses the ketones in your system for energy. This is an amazing thing and it helps the brain to heal. When you cheat, first - who are you cheating? Cheating will take you out of ketosis and it can take up to a week to get back into ketosis after that meal. But sometimes life happens on the way of our plans. So if you were in an event or you had a reason to eat foods that are not keto friendly. Come back to the plan. Remember why you started. Sleep - Make sure you sleep at least 7-8 hours a night. People think that they can perform fine without sleep. Sleeping is the magic pill for the brain. When we sleep the brain recuperates. Whatch this video of Dr. Berg where he explains about sleep. Separating or removing the forbidden foods from your pantry to another cabinet can help you stay focused. Sometimes the scale is not showing your weight loss, but a tape measurement can. Measure yourself often. Tracking your progress in the FitStream App can be helpful. You can drink broth (here is my recipe), you can add salt to your water or shakes. When you drink bulletproof coffee (here is my recipe) you become satiated from the fat and it can help you in skipping a meal. Have enough sleep. At least 7-8 hours a night. It is a must for optimal brain healing and performance. Always have hard boiled eggs, olives and pickles and avocado ready in the refrigerator for the moments of weakness. If you eat dairy - make sure to chose the full fat options, eat the fatty parts of the meat, eat the chicken with the skin. Before eating, check your plate. If there is not enough fat in your plate - add 1/2 avocado. Avocado, coconut oil, eggs, fatty parts of meat, nuts, butter and full fat dairy products (do not use milk - it contains lactose, which is sugar). Check this list of permitted foods on keto. When you are going to eat with friends you don't want to stand out, but you don't want to break your routine. You can always go safe if you eat the meat with some vegies. I have an entire article about that topic. I don't like to eat fake foods. For me fake foods are foods that resemble foods that they are not. If I cannot eat bread, I will not make bread with a keto friendly flour. I have tried. It doesn't taste the same and for me, it is a waste of time and money. Ideally, you should be eating 5-10% calories from carbs (net carbs - which is counted by subtracting the amount of fiber from the carb content), 15-30% of calories from protein and 65-75% calories from fat (or even more) in order to benefit from ketone bodies produced by your liver. Read my article about dietary fat. Intermittent fasting is not a diet, it's a pattern of eating. It's a way of scheduling your meals so that you get the most out of them. Intermittent fasting doesn’t change what you eat, it changes when you eat. 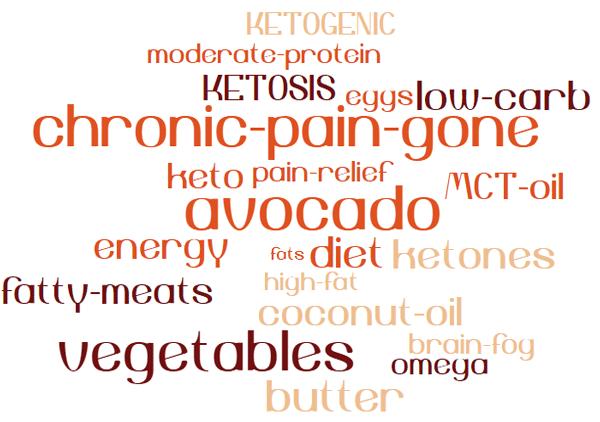 One thing is sure - The ketogenic diet is simple. There is no need to buy specific foods, to go overboard in getting food supplies and what is even better, since ketosis lowers your appetite, the diet is even affordable. At first it can be a little overwhelming since we were taught to eat low-fat foods, eat three meals a day and even do not skip breakfast. Following the ketogenic diet is simple, but it takes a little planning.